Install the plugin like you do any other plugin, here's a step-by-step guide on how to install a WordPress plugin. Once you have installed and activated the plugin, to Appearance > Customize > Fancy Coming Soon settings > General Options > Check the Preview coming soon option. Click the save button and refresh the page. This will enable the preview mode on and you can make the changes from customizer. Note: Fancy Coming soon won't be visible / enabled if you are logged in. This is done intentionally so you (as an "admin" of the site) can make changes and your users will still see the coming soon / landing page. Next, you can add information about your site from the different options. Everything is pretty much explainable, except the MailChimp part, so I'm going to emphasis on that (but if you have any questions, please don't hesitate to get in touch). In order for MailChimp form to work properly, you will need get the MailChimp signup form url. Login to your MailChimp account, go to Lists > Select Signup Forms from the dropdown. Then click the embedded forms option from the signup forms page. Here you will find the code for MailChimp form, copy the code and paste it to the notepad. Reason being, we only need the action url from the form and MailChimp won't allow us to copy single line code. So you will end up copying the whole code. I selected "Naked form" because it doesn't have any stylesheets or extra code. 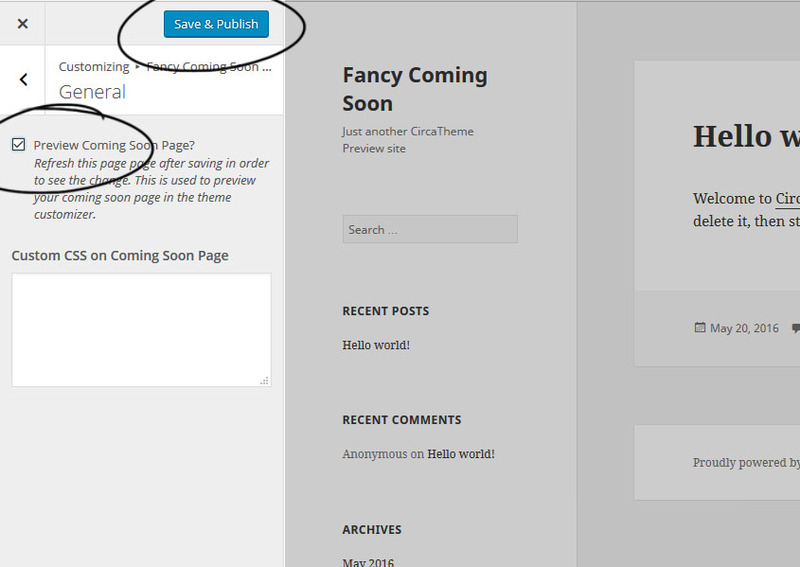 Now go to the fancy coming settings page on your site and paste the code in MailChimp Form section. Make sure that the code starts with two slashes (like this //) and not with HTTP or HTTPS.